Doing these 7 things when cleaning your home can be dangerous. Aesthetic purposes aside, one of the main reasons we clean our homes is to keep them as safe and germ-free as possible. 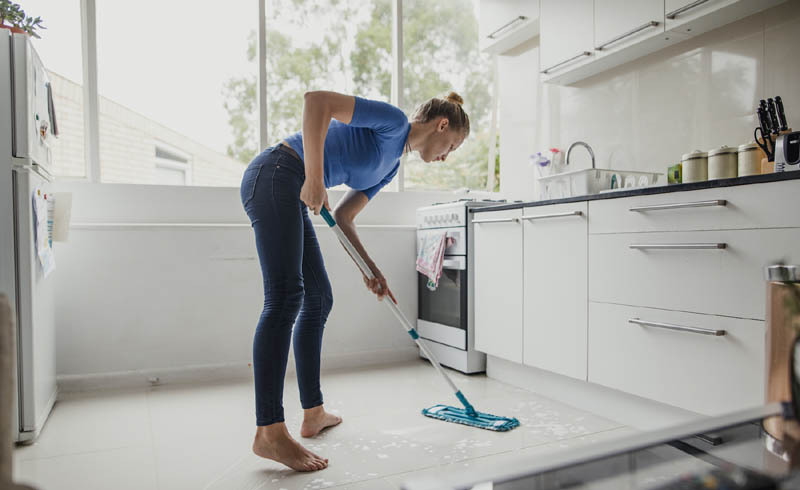 But if you accidentally mix the wrong chemicals or don't follow certain safety instructions, these seven cleaning mistakes could put you in danger. 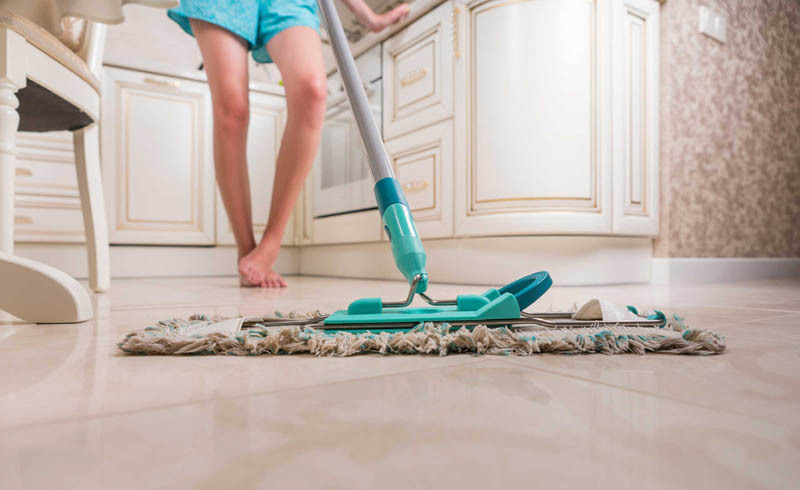 Keep your home as safe as possible by remembering these simple tips the next time you mix up a solution to mop the floors or do a load of laundry. You've probably heard this warning before—but it bears repeating. Mixing bleach and ammonia is incredibly dangerous, as it can create toxic chloramine vapor. Inhaling these fumes could cause respiratory damage and throat burns, or worse. And it's not just the pure forms of bleach and ammonia that can cause this reaction, but also mixing bleach- and ammonia-based products. To be sure, simply avoid mixing bleach with any other cleaner. This way, you'll never have to worry about a potentially dangerous combination. Cross-contamination of cooking tools, such as using a knife to cut raw meat before using it to chop vegetables without cleaning in between, can spread harmful bacteria that could make you and your family sick. To prevent this, always wash your knives with hot, soapy water after preparing raw meat. It's also a good idea to invest in a set of color-coded cutting boards, so you can designate one for meat, another for veggies, and a third for fish. The self-cleaning oven feature is hotly contested. It uses high temperatures, up to 700 degrees Fahrenheit, to burn away bits of food and grease, saving you from having to manually clean the appliance. However, some warn that the high temperatures can end up causing damage to parts of your oven, and the fumes may even be harmful. Many self-cleaning ovens are lined with Teflon, which when heated to these very high temperatures, can produce fumes that are toxic to small pets like birds, and may cause respiratory irritation in humans. And while being in the house during the self-cleaning process could expose you to fumes, it's also a good idea to be present in case of excess smoke as food burns off. The best way to play it safe: simply avoid the self-cleaning button, and try our easy method for cleaning your oven instead. Most of us probably already know that we should only use harsh cleaning products in a well-ventilated area, yet how often do we really worry about it? According to one study, prolonged use of cleaning products (the study looked at professional cleaners) can have the same effect on lung function as smoking cigarettes. Even if you don't clean every single day, you can be gentler on your lungs by using more natural cleaning alternatives, like mixing your own solutions or swapping in vinegar for harsh chemicals where possible. One more easy switch: the American Lung Association recommends skipping the air fresheners. Try potpourri or an essential oil room spray instead. We all know we're supposed to remove lint from the dryer after every load of laundry, but there are likely times when we've all let it slide. Learning more about the risk of dryer fires could convince us to take this simple chore more seriously. According to the U.S. Fire Administration, about 2,900 dryer fires are reported each year, and about one-third of the fires are caused by an accumulation of lint. To prevent a fire, clean the lint filter after every single load, and clean out the ductwork at least once per year. Besides keeping your fridge clutter-free, cleaning your fridge often can prevent you and your family from accidentally eating expired foods. If your little ones are able to grab food from the fridge themselves, it's a good idea to check your fridge frequently, making sure to toss out any expired packaged foods, dairy, or old leftovers. If done at the end of every week, the task shouldn't take too long and could help your family avoid getting sick. Sure, mold and mildew is unsightly, but you may be more inclined to actually take care of the problem when you consider its health effects. Mold allergies can make you cough or cause your eyes to itch. Pay special attention to signs of mold in your bathroom, kitchen, and other damp areas, particularly around the caulking of your bathtub or around an exhaust fan. Besides appearing on surfaces around the home, mildew can also grow on clothing and bath towels. Follow these steps to clean your washing machine of mildew, and be sure to only put away completely dry, not damp, clothing.